This year’s Air Force vs Denver game planted a nagging question in my head. First some background. Last year, Denver led D1 with roughly 36 minutes of possession per game, thanks mostly to Trevor Baptiste’s dominance at the face off X. 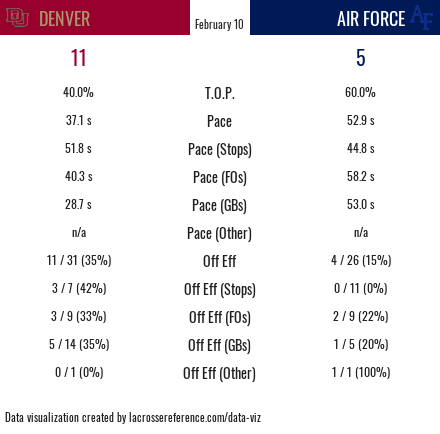 But in their early season game, Air Force managed to flip the script, holding the ball for 60% of the total game action. Of course, Denver won because their offense was more effective (33% efficiency vs 15% for the Falcons). But they also benefited from 7 additional possessions (surprisingly, not because of faceoff dominance though). Which factor is a better predictor of winning? Do teams that control possessions also control the ball for longer? How does substituting faceoff win rate for possession margin change things? So I did some analysis on the games from last year and whatever games we have so far in 2018. Some of the answers to the above questions surprised me. I’ll walk through the general topic areas one by one. Is possession margin or possession rate a better predictor of winning? Those that have coached or played more lacrosse than I have may already know the answer to this question. But it was a bit of a surprise to me. The short answer is that for both metrics, the more you have, the more likely you are to win the game. Given the sample size of 646 games, it’s impossible to say which is the better predictor. 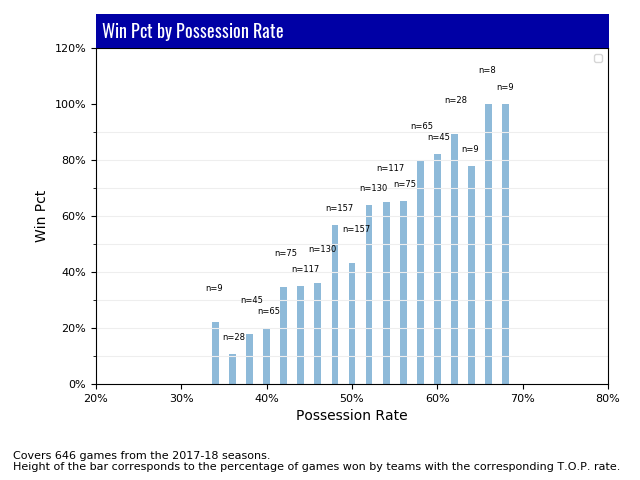 In both cases, the win percentage goes up dramatically as the amount of possession goes up. But I will say that I was a bit surprised to see that possession margin was not a superior predictor. Every possession is a chance to score a goal, regardless of how long it lasts. The overwhelmingly most popular offensive tactic is to get the ball into the offensive end, settle into a rotation for a certain amount of time, then start to attack. But the fact that the “settled into a rotation” step lasts as long as the team wants (shot-clock notwithstanding) means that possession rate is highly influenced by these waiting periods, the length of which has little impact on whether the possession results in a goal or not. At least compared to the effectiveness of the actual attacking action. 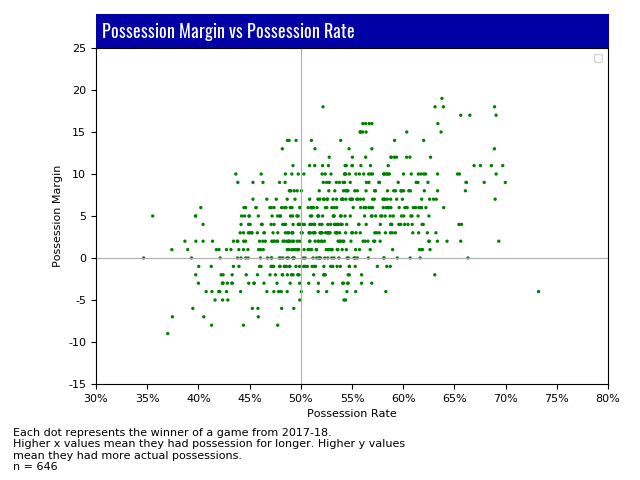 Since possession rates can be inflated without affecting possession margin or offensive efficiency, it would follow that possession wouldn’t track with win rates as closely. But I don’t see enough variation to say that this is the case. Does a possession advantage mean a time-of-possession advantage? For those that doubt my previous statement to be true, this next chart may provide some ammo. 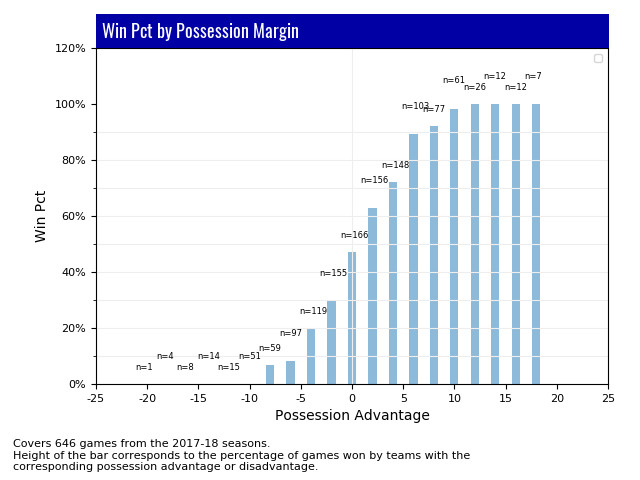 Since possession rates are not markedly worse at predicting winners than possession margin, does it follow that teams with possession margins also end up having possession rate advantages? In short, does more possessions mean that you have more time-of-possession? Short answer here is a (mostly) resounding no. Clearly, these two metrics are positively correlated. Which makes sense, all things being equal (i.e. time per possession), if you have more possessions, you’ll have more time-of-possession. But the relationship is not a neat, tightly correlated one. Our scatter plot, which covers every game in our sample, looks more like a blob than a line. There are a huge number of games where a team had way more possessions, but lost the time-of-possession battle, often by a large margin. So if you believe that time of possession is a worse predictor, you can look at this chart as evidence. Anecdotally, we know that there are teams out there that really take the air out of the ball. If you have a team that holds the ball vs a team that is more inclined to take an early shot, then the team that holds the ball is very likely to come away with a time-of-possession advantage. But that doesn’t say anything about their possession margin or their chance of scoring more goals than the opponent. It just says that they held the ball longer when they had the chance. Does time-of-possession negate a possession margin disadvantage? I don’t really address this question here in a statistically meaningful way, but I wanted to raise it anyway: does holding the ball and winning T.O.P. do anything to negate a possession margin disadvantage? Because there are so many dots in the scatter plot that reflect a team winning the possession margin battle but losing T.O.P. (or vice versa), it is clear that some teams are employing this strategy. Anecdotally, when I looked at games where a team who usually wins T.O.P. loses the game, it was not because the opponent controlled the ball for longer (there was almost no relationship). This is not quite an apples to apples comparison, but it certainly doesn’t support the idea that you can overcome a possession disadvantage by simply holding the ball longer than you would otherwise. This corollary to our original question was posed by a reader on Reddit. And since it was pretty closely aligned with the rest of the analysis, I figured it would be a piece-of-cake to throw it in. The result: faceoff win rate is a worse predictor of overall winning percentage than both possession rate and possession margin. As with the others, the relationship is positive. The more faceoffs you win, the more likely you are to win the game. But the relationship is pretty spotty. 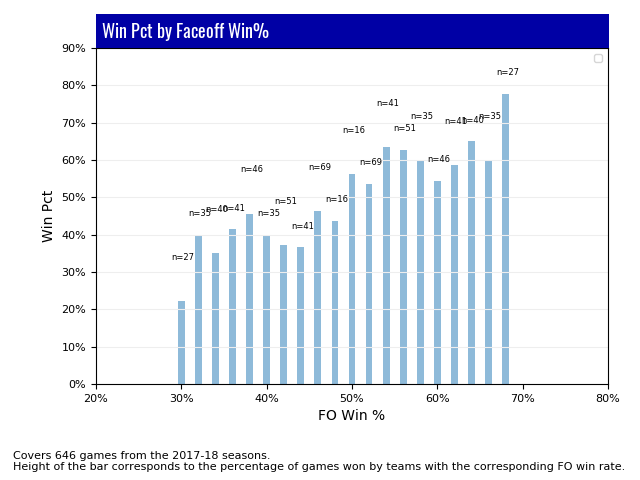 As you can see in the chart, teams that win 37-38% of their faceoffs have won at about the same rate as teams that won 45-46% of their faceoffs (about 125 games combined). And they won more than teams that won 47-49% of their faceoffs. From a tactical point of view, again, this makes sense. Possessions that begin via something other than a faceoff come from defensive stops, penalties, or ground balls. I would argue that a team’s success in these areas is more closely aligned with their overall level of team talent. Face-off win rates are heavily influenced by one player per team. If you follow this through to its logical conclusion, it is more likely that a strong team will overcome a poor FOGO and have a solid win percentage than a poor team will be dragged to a good record by an excellent FOGO. Whatever you think of the importance of the FOGO position, here is some statistical evidence that it is dwarfed by overall team strength.